Enjoy our new “backyard”. We’ve spent many winters cycling in this region of Sicily and now it’s time to share it with you. This tour was inspired not only by our own local knowledge and enjoyment, but also by our friend Giuseppe, an ex-racing cyclist who has spent most of his life here. He knows literally all of the roads, all of the hotels and most importantly, all of the great food and wine. He’ll help us produce the tour to maximize everyone’s enjoyment and even supply the bikes! 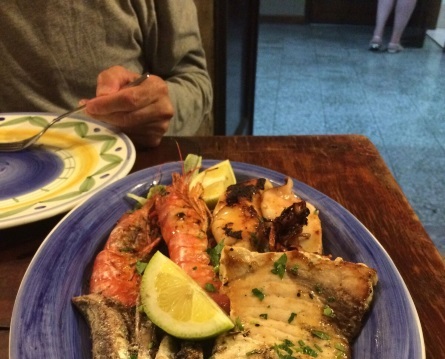 Day 1 – Overnight flight to Catania. Day 2 – Benvenuto! We’ll pick you up at Fontanarossa and shuttle you to Hotel Royal Maniace, on the island of Ortigia, where your hosts have enjoyed the winter months for the past few years. Bike fitting and orientation meeting before our sumptuous welcome dinner. Fresh fish anyone? Day 3 – Some of your hosts favorite roads await as we depart the island and head inland amidst olives and oranges toward our lunch destination of Buccheri. After pranzo we’re on to Vizzini where our lodging has been artfully carved into a rocky hillside. At tonight’s group dinner we’ll enjoy bread freshly baked in their wood-fired oven. 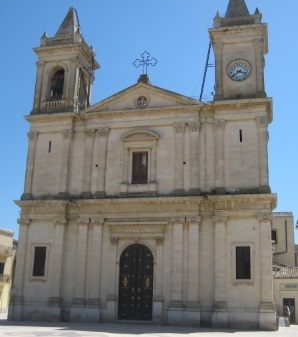 Day 4 – On today’s ride we’ll pass near Ragusa on our way to the chocolate town of Modica for a two-night stay. Enjoy the Baroque architecture, but keep an eye on the challenging climbs and descents! Tonight’s group dinner will be at Osteria dei sapori perduti, a Giuseppe favorite. 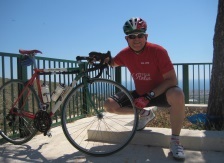 Day 5 – Loop ride today down to the sea or spend the day exploring Modica and its countless chocolate emporiums or perhaps seeking out locations used for the famous “Inspector Montalbano” TV series. Open night for dinner. 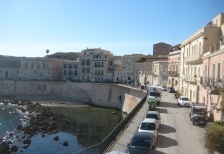 Day 6 – We’re off today through more Montalbano country as well as the land famous for Pachino tomatoes. Enjoy more seaviews on our way to an agriturismo just outside Noto. Take a refreshing swim before another multi-course dinner of Sicilian specialties. 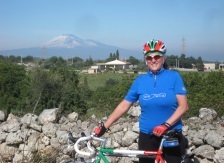 Day 7 – Today’s loop ride winds through more “Harry & Leather” countryside above Avola, the town of the famous Nero d’Avola wine. We’ve been up these climbs a time or two during the winter season but they’re more scenic in June for sure! Tonight Giuseppe will show us around Noto. Open night for dinner in the lively Baroque city. 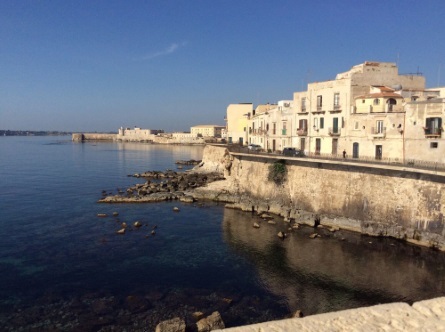 Day 8 – Today we return to Ortigia, through the nature preserve of Cavagrande before a seaside stretch frequented by your hosts followed by quiet farm roads onto the “isoletta”. 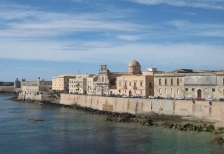 We’ll board a boat for a crossing of the Porto Grande and admire the splendid views of Ortigia along the way. Enjoy a final passegiata along the splendid seafront before our festive farewell dinner. Day 9 – Morning airport shuttles. Special details: Overnight flights to Catania can be found via major carriers but you may also consider flying directly to Rome or Milan, then using a carrier like EasyJet or Ryanair to get to/from Catania. To make this even easier, we’re including bike rental in the package price, so all you need to bring is your shoes, saddle (optional) and pedals. No problem if you’d still like to bring your own bike, we’ll store the box/case while we’re on tour.